For many gardeners, it's hard to take a vacation during the growing season for fear of plants drying out, insects invading, or things going awry away from your watchful eyes. But if there is one type of vacation that can pull you away, it might just be a trip to one (or several) of the world's greatest botanical gardens. 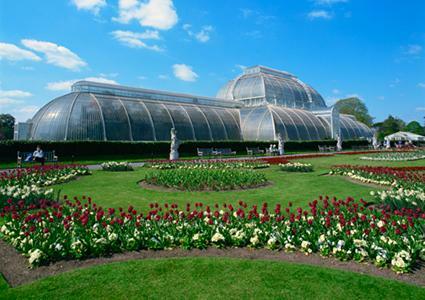 Opened in 1759, Kew contains the world's largest collection of plants - 30,000 different living specimens with around seven million preserved in its herbarium. The the 60-foot tall glass Palm House is probably its single most famous landmark; it is a massive greenhouse filled with thousands of palms and other tropical specimens. Originally built in the mid-1800s, it now features a raised catwalk that allows visitors to observe the jungle canopy. Admission is 15 pounds per person, which gets you a full day access to the 300 acre site with its lavish Victorian era gardens and curiosities like the climate-controlled Alpine House for high elevation plants. 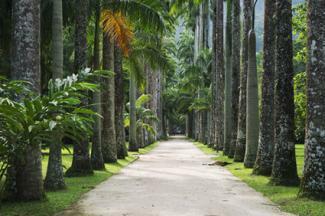 Founded in 1808, Brazil's most famous botanical garden is 145 hectares of tropical paradise. The garden is at the foot of Corcovado Mountain in the shadow of Rio's famous Christ the Redeemer statue and is known for the many species of semi-tame tropical birds that call it home. It was started by Portuguese colonists as a repository for the agricultural products they were cultivating the New World - especially valuable spice trees - but is now home to 6,000 tropical species, with a special focus on rare palms, orchids bromeliads, and carnivorous plants. It costs a mere 6 reiais (about $3) to get into Rio's Jardim Botanico, a paltry sum compared to most other world-class botanical gardens, and it's a great opportunity to get to know a few Amazonian species, as well as those native to the coastal rainforest of the region. The 52-acre century-old botanic garden in the Flatbush neighborhood of Brooklyn is arguably the most famous botanical garden in the United States. There are numerous thematic garden areas specializing in things like roses, fragrant plants, native species and Japanese garden design. One of the most popular areas is the planting of cherry trees - over 200 specimens erupt in pink and white blossoms, making a stunning fairyland of falling petals in spring. The Brooklyn Botanic Garden is affordable at just $10 per adult to get in. One can easily spend a day strolling the grounds and there is a special children's garden, as well, for the under 12 age group. Australia's flora is as strange as its marsupial wildlife and the Royal Botanic Gardens in Sydney are a great place to learn about it. The 30-hectare gardens are located on the site of the first farm established by the British Empire in Australia, which was converted to the country's first official botanical garden nearly 200 years ago. 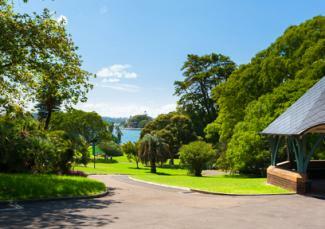 It is located next to Australia's most famous landmark, the Opera House on Sydney Harbor. 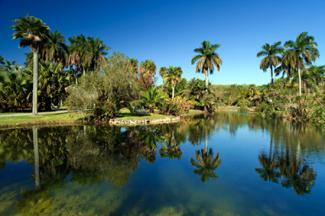 The gardens, however, are famous for its begonia collection, 'fernery', camellia garden, and rainforest collection. Both the gardens and the large parklike area surrounding them called the Domain, which is quite a botanical treat unto itself, are free to the public. If you're lucky (or unlucky, depending on your point of view), you may glimpse one of the flying foxes that inhabit the gardens - they are large bats that once lived in a colony 22,000 strong in the area. Canada's most famous botanical garden is located in the heart of Montreal across from the Olympic Stadium. Naturally, it is covered in snow for about 5 months of the year, but the enormous greenhouse complex is open year-round and is home to the famous Butterflies Go Free festival in late winter each year. The 190-acre facility houses the country's largest collection botanical specimens (about 22,000) and has a major focus on the conservation of endangered species. Admission runs around $20, but that also gets you into the adjacent Insectarium, which houses the largest collection of insects in North America, both live and preserved. Singapore, a former British colony on the Malay Peninsula in southeast Asia, was founded as an outpost of the global spice trade that catalyzed the European exploration of Asia centuries ago. Its world famous botanic garden, similar to the one in Rio de Janeiro, started as an agricultural experiment station to test the potential for various high-value tropical crops in 1822 and in the 1870s led the development of the rubber tree industry which resulted in Singapore emerging into an economic power. 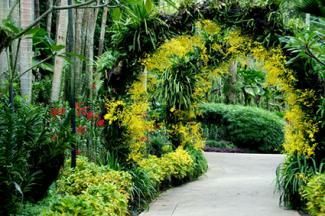 Today, however, the garden is all about tourism and boasts one of the world's greatest collection of tropical orchids. Admission to the National Orchid Garden is $5, but the rest of the 183-acre facility is free to the public and includes thematic areas dedicated to rainforest species, evolution, a children's garden and the famous ginger garden, featuring 100 of species in the ginger family and a popular restaurant. Kirstenbosch, located at the foot picturesque Table Mountain in Cape Town, is known for it gorgeous setting, as well as for being the only prominent botanical garden in the world dedicated to the cultivation of native species found within its region. In South Africa, this includes some extraordinary species, such proteas, pelargonium, bird-of-paradise, ericas, and cycads. The formal gardens recently celebrated their centennial, but the site has a fascinating history in as part of the original Dutch settlement in the area and includes remnants of the famous wild almond hedge that was planted around the entire colony in 1660. The site covers 528 hectares, much of which is preserved in native forest. Admission is 45 rands (about $4) and includes free tours of the gardens. 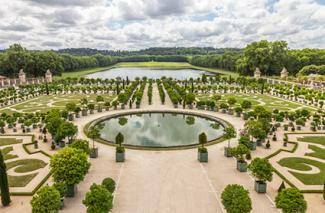 Part botanical garden and part royal compound, Versailles' 800 hectares of immaculate landscaping make it the largest and most visited garden anywhere in the world. Here, the focus is as much on the design as it is on the plants. There are incredible displays of potted citrus species, intricate topiary and extravagant bulb plantings including many of the most rare and valuable tulip varieties. But there are just as many famous architectural features, not just Louis the 14th's palace, but also the nearly mile-long grand canal, a myriad of formal fountains, as well statuary of every type and description. Eighteen euros gets you in to both the palace and the gardens, as well as your fill of numerous guided tours and special exhibitions. Another estate-botanical garden, this one on the other side of the Atlantic and not nearly as well-traveled on the tourist circuit, is Dumbarton Oaks, a historic estate of diplomat and philanthropist Robert Woods Bliss and his wife Mildred. It is very well-known among American gardeners, however, for its 54 acres of landscaped grounds designed by the famous landscape architect Beatrix Farrand. It is known for its stepped terraces and intimate garden rooms, though it also includes elegant renditions of functional garden elements, such as its cutting garden, vegetable plots, and orchard. Dumbarton Oaks was recently ranked as the sixth greatest botanical garden in the world by National Geographic. Admission is $8 from March 15th through the end of October and free the rest of the year. Named after David Fairchild, one of the great American plant explorers of the early 20th century, the gardens were established by a prominent Miami businessman as a repository for Fairchild's collection in 1938. It is the home of the American Orchid Society collections, but is equally well-known for its extensive collection of tropical fruit trees, a passion of its founder and namesake. Fairchild's 83 acres are home to one of the greatest collections of palms and cycads in the world and is also host to well-know plant-themed festivals, such as the Mango Festival and Chocolate Festival. Admission is $25. The world's botanical gardens are an important repository of the planet's biological heritage and for this reason, are hotspots of research and conservation work. For the everyday horticulturists, however, they are an opportunity to experience paradise in the form of a garden.